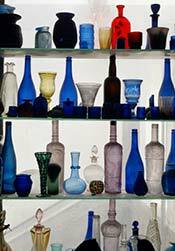 ABOVE: Murano glass bottles from different eras. We often get e-mails from readers who want us to repair, replace, or make replicas of their broken glassware, light fixtures, and other objects from Murano. Sorry, folks, but we aren't glassmakers, Murano glass dealers, or even glass collectors--we're writers who publish a European travel-planning site. If you're looking for an item to replace a broken glass object, your best bet is to visit Murano (or Venice) and find a substitute that you like even better. The island and city are dotted with glass galleries, shops, and factory showrooms that offer goods in every price range, so it's unlikely that you'll go home empty-handed. Another possibility is to contact an antique dealer or the glass curator at a museum to find a restorer within your own country. Or read "Put a Crystal Vase Back Together" in The Washington Post, which listed two repair services in the United States when it was published a few years ago. Warning: Restoration or custom replacement won't come cheap, so you might be better off buying a substitute on eBay if your object isn't valuable and you're strapped for cash. The Scuola del Vetro Abate Zanetti offers training courses in glassblowing and other glass-related techniques for serious students who have time and money to spare. If you'd just like to spend a couple of hours making jewelry with Murano glass beads, check out Viator's Private Tour: Murano Glass Workshop. Top photo copyright © Cesco19. Inset photo copyright © Alejandro Mojo.